The VIDEO on this topic is at the BOTTOM of this web-page. Hi. I’m Dr. Patrick Foye. I’m an M.D. or medical doctor and I’m the Director of the Coccyx Pain Center, or Tailbone Pain Center, here in the United States. This is a quick video just to just to look at a different type of cushion. 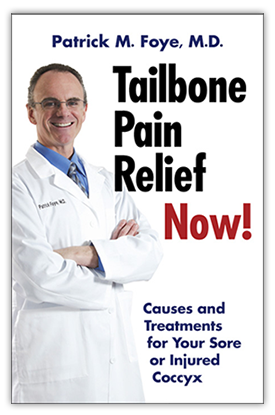 I see lots of patients who have tailbone pain. They fly in from all over the country, occasionally internationally, and they have different types of cushions that are with them. So, sometimes if I see something that’s a little less common I make a quick photo or video just to show that for people who may be looking for cushions or not have or have not found a cushion that works well for them yet. So some cushions have a crease in the middle and what that does is mainly two things. Number one: it folds to sort of half the size. So that that way it looks more like it looks more like a purse or a sort of a very low-profile or thin handbag that you could carry along. So it doesn’t look quite as noticeable to other people, as compared with carrying one of the bigger coccyx cushions. 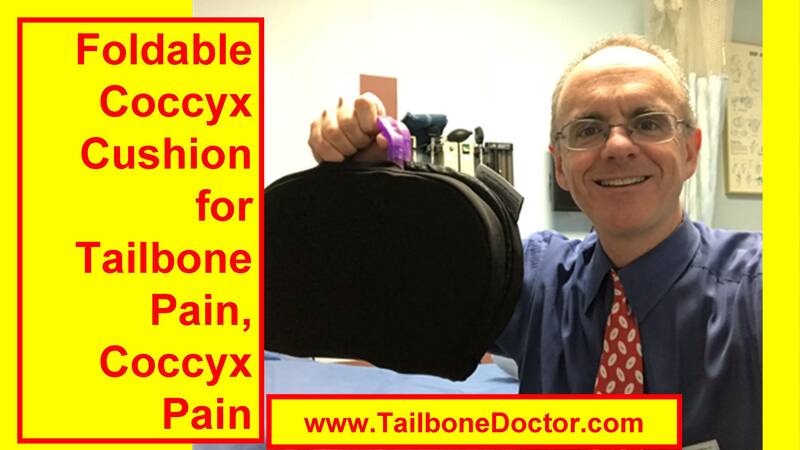 So anyway, the crease in the middle… the thing about the crease in the middle (and I’ll see if I can hold this up a bit to demonstrate) is that when you sit… that essentially the tailbone or coccyx in the middle is essentially over the crease. So that’s what helps to have you put your body weight onto the other two sit bones but not so much onto the coccyx. Number one: it lets you fold it and make it look more like a purse. Number two: is that the crease then is a spot where the coccyx sort of floats or hovers over the crease, so that it’s not contacting the seat and therefore less painful for you. The one other thing about this particular cushion (and I’ll see if I can zip it open a little bit here) is that it’s essentially a gel material so you can probably see that. … is that the gel may hold up better over time, theoretically, compared with the some of the thinner foam. Especially if it’s not a particular sturdy foam, they can sometimes flatten over time and then become less effective because it’s squashing down like a pancake and it’s not really lifting your tailbone up off the chair. So again, this is just a short video to review a cushion that’s a little less common than the ones we normally see with the cutout in the back. It doesn’t mean this one would be perfect for you… it may or may not be. But it’s one more to consider if some of the standard cushions are not doing the job, or if you’re in a setting where the appearance is really important for you in terms of having something that’s kind of more low-profile, to think about the ones that are split in the middle in that way. Or if you’re somebody that your cushions are always flattening out on to and two-three months after using it you have to finding your need to get a new one and you may want to think about trying something with gel or something like that. Anyway so that’s some information about coccyx cushions and particularly this one with the gel with the split in the middle. In my book “Tailbone Pain Relief Now!” I have a whole chapter about cushions. If you have questions, or thoughts, or comments, or want to mention about what cushions you’ve tried, or found helpful or not helpful, post your comments below. I’m sure they’ll be helpful for myself and others to see.